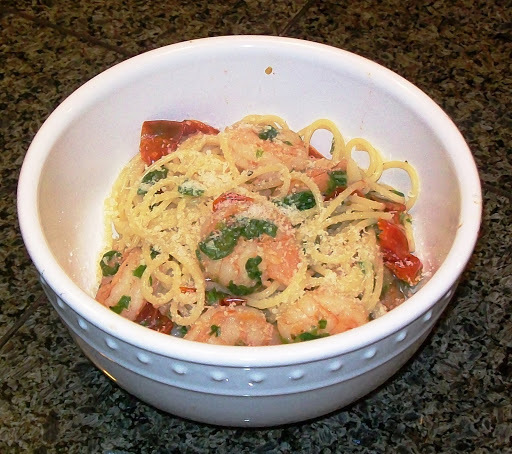 I picked up last night where we left off with the Italian Style Garlic Shrimp with Cherry Tomatoes and Thin Spaghetti (remember I didn’t have all the ingredients to make it the other day?). I have to admit I was a bit nervous that I would over cook the shrimp. I have done all kinds of fish, clams, muscles, scallops, but for whatever reason I get nervous when I cook shrimp. I know that if you overcook it they are rubbery and awful, so I just was a bit worried. But this is a recipe that, if you follow the directions, you can’t mess it up. It was great! My nerves gave way to a very hungry tummy as I was cooking. I had a houseful last night. Kevin, Jessi, Seth, and Melissa were all here for dinner. Everyone gave this recipe their seal of approval, even Jessi, my pickiest eater. My Dad just doesn’t like seafood so he was out of this one. All of us, except Jessi of course, thought the addition of some red pepper flakes would be fantastic in this. But as it stands it is still a terrific meal. You know we just like things a bit hot in this house. So in my wrap up here I will say MAKE THIS RECIPE!! 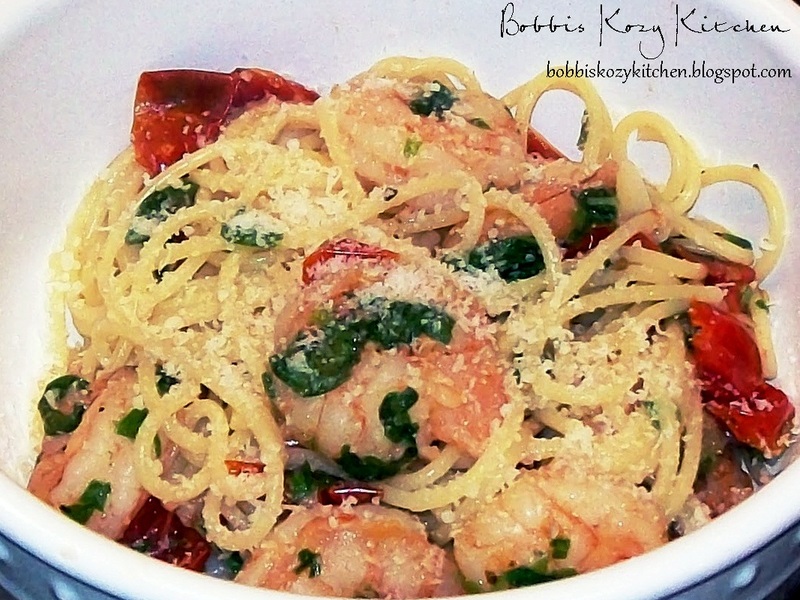 This was a master recipe too and the variations sound just as yummy, Spanish Style Garlic Shrimp, and Greek Style Garlic Shrimp……stay tuned for those, I know I am excited!